Hello there! For my 'stand alone' piece I have used up some left over pieces from the pretty *TRIPLE ARCH FRAMES* I have done a few of these now and was left with several of the insides. 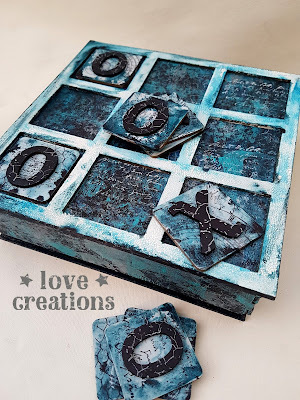 I glued some small and large ones together before decorating with stamping and paint effects. 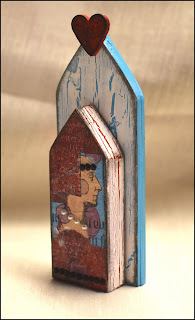 Before I attached the smaller arches to the larger ones I glued a piece of card behind the smaller one to create a gap. Then only attached a section of the smaller arches to the larger ones. I added a heart to the top. It is a last day of the Crackle Week and here is what I wanted to share with you. 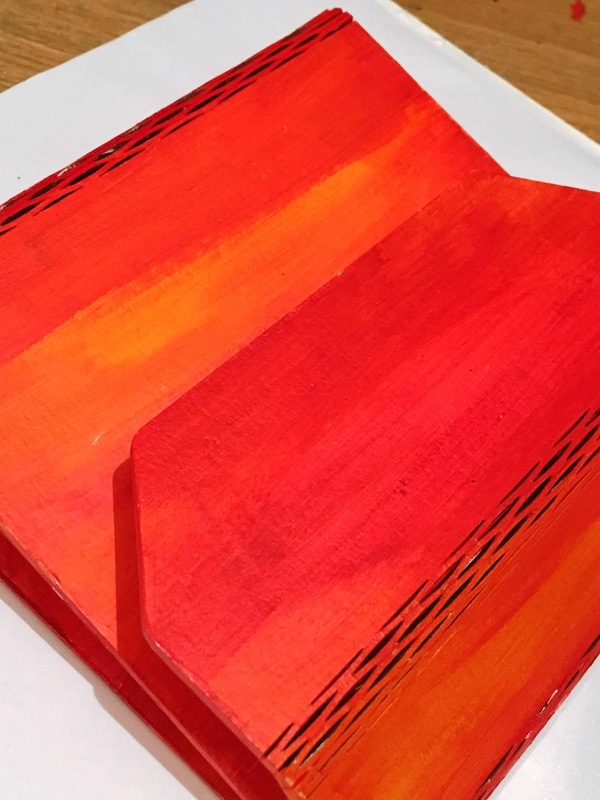 This box was decorated with quick but very effective technique which is painting with brayer, and here's how to do it. Squeeze a few dots of medium acrylic paint on the craft mat and start rolling your brayer to get even, thin coat, then run it through box parts, I'm always starting with darkest colours, then gradually moving to the light ones. Repeat this step with all of the colours and as many times as you like until you're satisfied with your background. 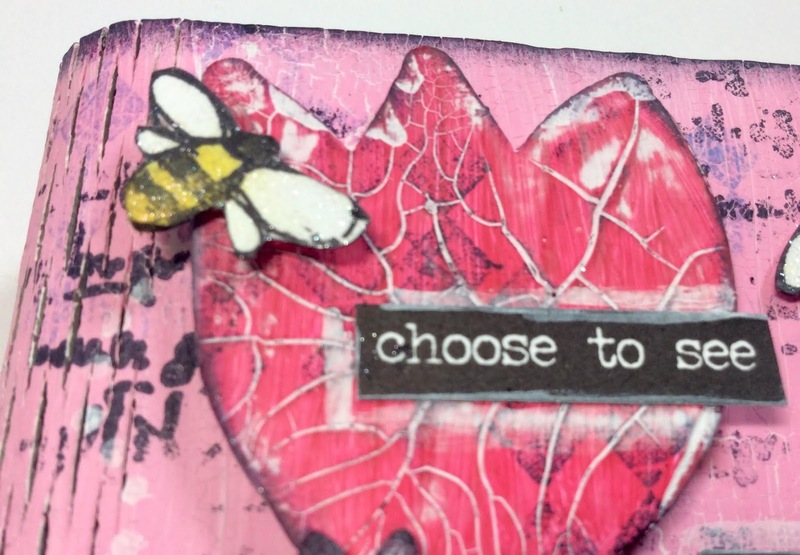 Using your favourite text stamp and white StazOn ink stamp the background randomly. Paint the top sqare frame with gesso and then with crackle paint . 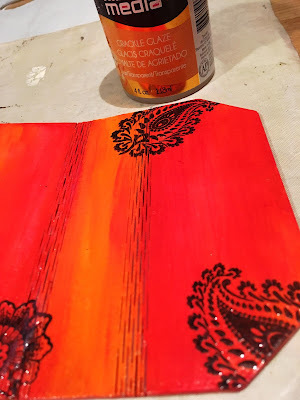 Once dry add a wash of media fluid acrylic paint. 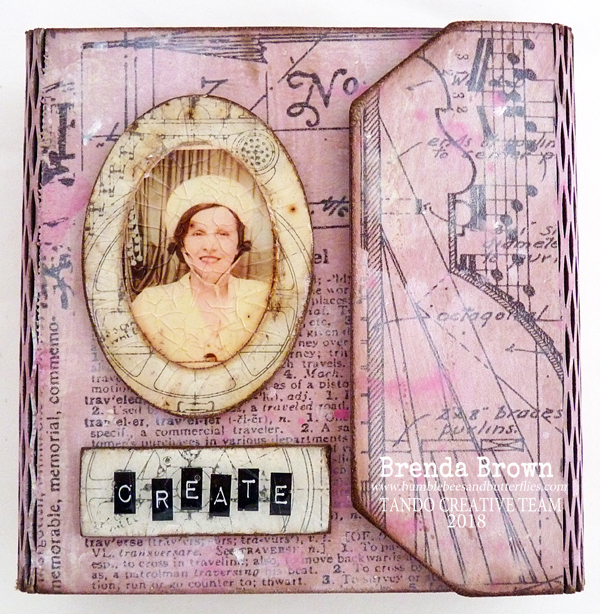 Paint little squares with white paint, then stamp it with your chosen stamps and black Archival ink. 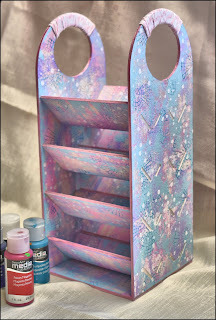 Add a wash of media fluid acrylic paint. 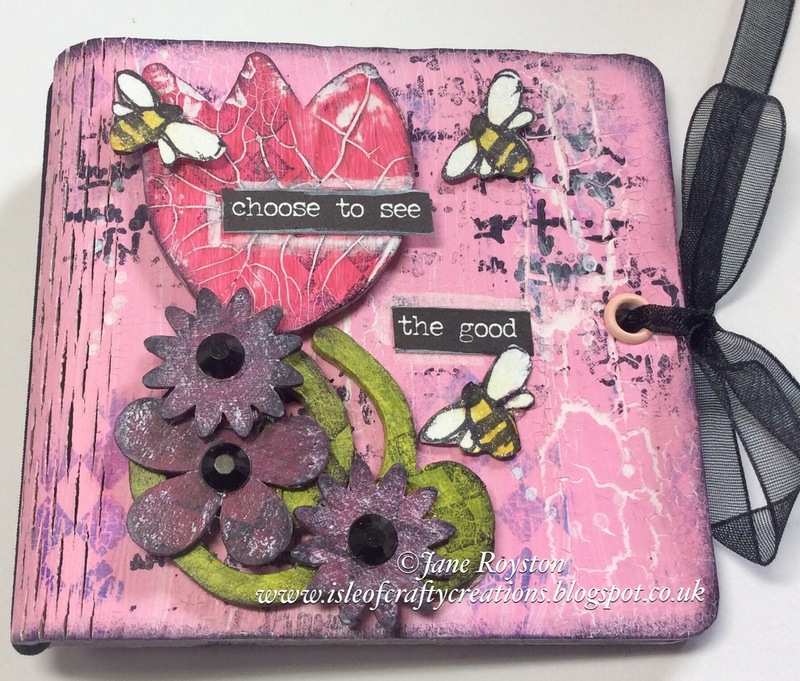 Cover X & O with dark colour and stamp with white StazOn ink using crackle texture stamp. Assemble the box using strong craft glue and enjoy! Hi all, so it's Crackle Week here at Tando Towers! 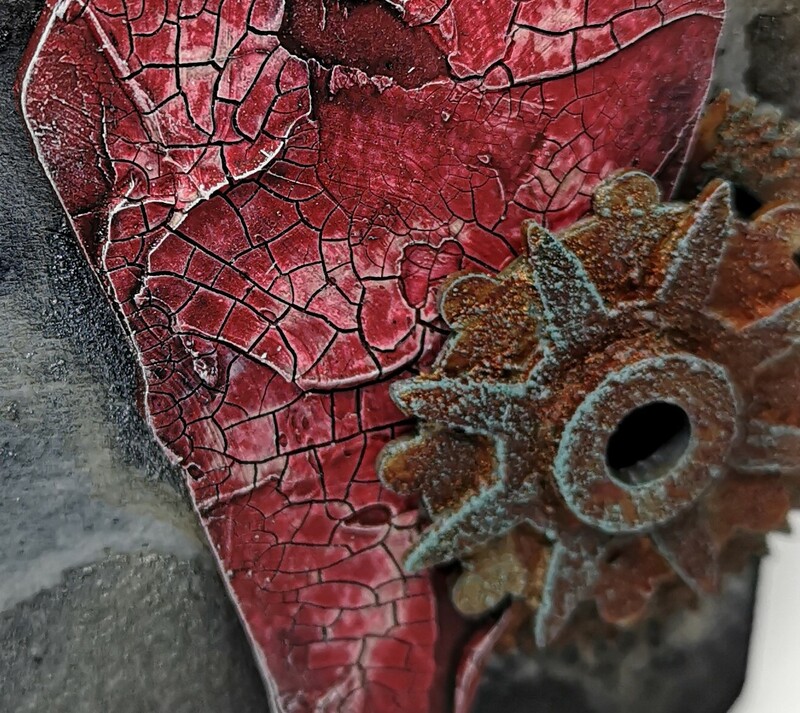 Crackle is one of my favourite ways to add texture to a project, I love the aged look it gives. 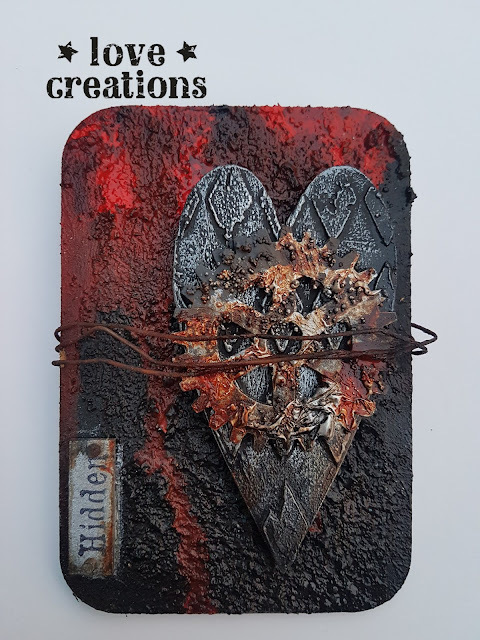 Today I would like to share with you a mini book, featuring a crackled heart. 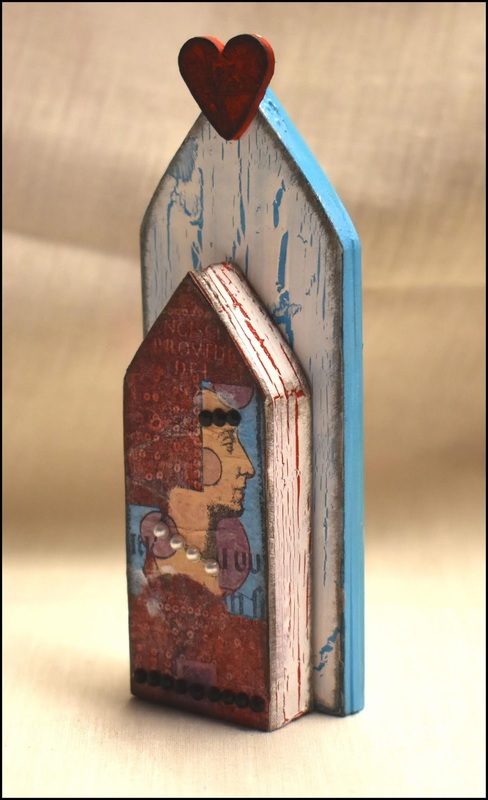 The mini book itself has been layered with DecoArt Textured Sand Paste, painted in metallic silver and then washes have been applied. 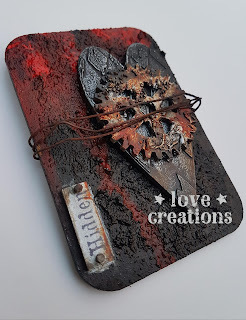 The main focus of the piece is the heart, layered generously with DecoArt Crackle paint, this has been painted in red, washes applied to darken and distress, areas of the red have been rubbed back and finally finished with dry brushing to highlight the textures within the crackles. The heart is sandwiched between cogs that have been given the rust treatment to add further detail and texture to the design. I hope you have enjoyed this mini book, until next time! 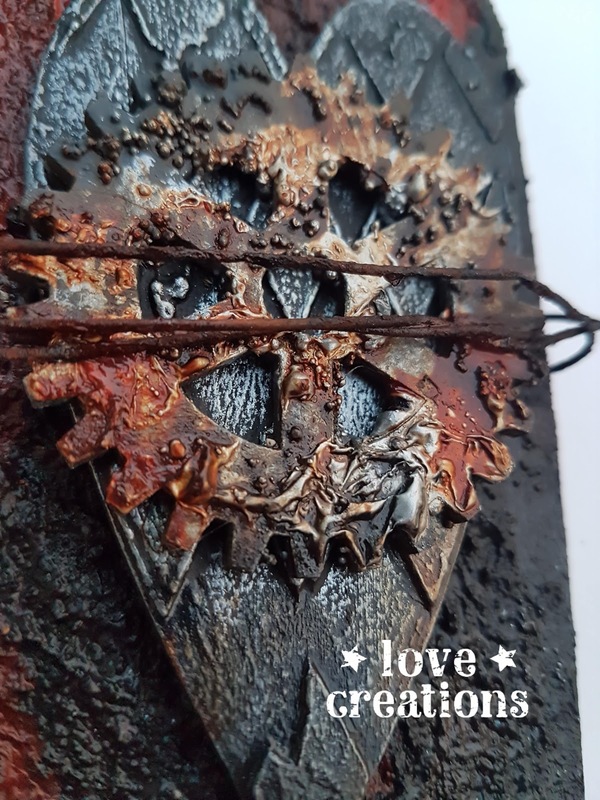 Hi every one Dee here with my project for Crackle week. 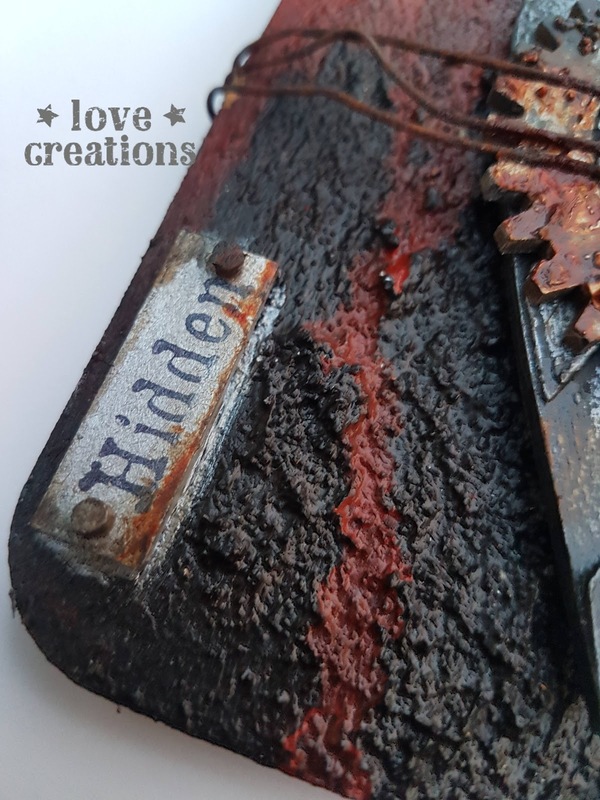 Firstly I gave a coat of chalk paint to the slide mount and using Andy's textures stamps I stamped with the script stamp using black archival ink. You can faintly see it through the crackle. Next I applied watery washes of yellow oxide and quinacridone gold till I was happy with the colour. Deco Art 2 step crackle was applied and left to do its thing. 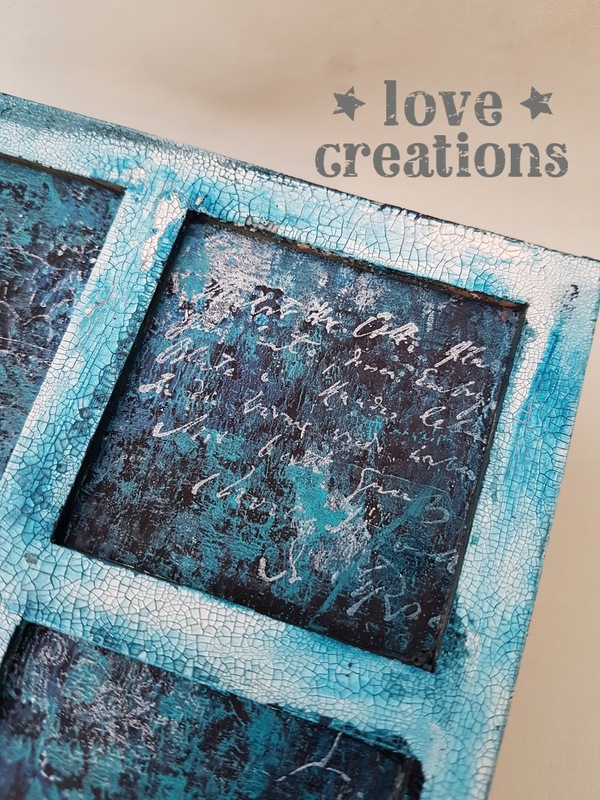 I used crackle paste and some triple embossed card that I had on my desk to finish off the corners. 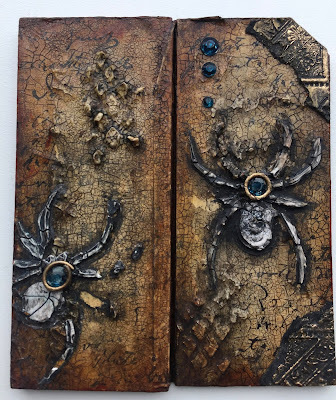 Raw umber was rubbed over to highlight the cracks and black antiquing cream was also used on the spider. I really quite like this little slide mount now just need to decide what goes inside. 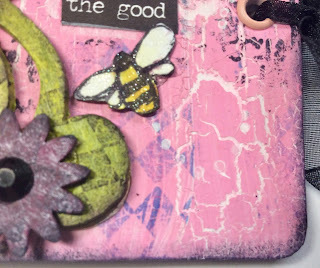 Andy Skinner Texture stamp set & chunky gold embossing powders. 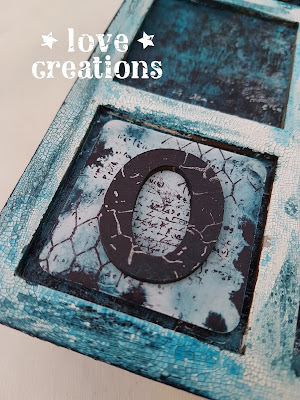 This week on the Tando Creative Blog the theme is crackle, one of my favourite techniques! 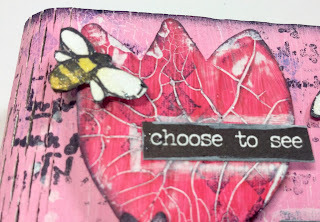 The final touches were some little bees that I stamped, cut out and coloured as well as some word stickers. To create my closure I used a crop a dile and eyelets to add my ribbon to. Crackle week - with Nikki K.
It feels like ages since I've had a post out. Did disappear for a couple of weeks to Scotland so it was a nice long break. My project is a Tando Mini Binder. Firstly I painted the binder in Primary Magenta, Pyrrole Orange and Pyrrole Red. Then added stamps from Chocolate Baroque's new Indian Elephant set, stamped in Versafine Onyx Black and heat embossed with Superfine Clear Embossing Powder. Next I added a layer of Crackle Glaze, and left to dry. 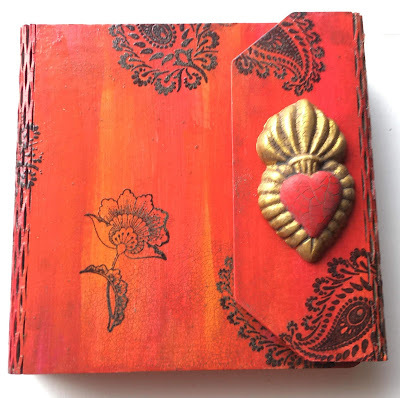 Once dry, add Raw Umber Antiquing cream with your finger, all over the binder, working it into the crackle. Wait for this to dry completely, then wipe off with a slightly damp baby wipe. You can leave as much of the patina on as you like, or wipe it back more until you get the desired effect. The Heart was painted in Pyrrole Red and Metallic Gold, and then covered in crackle glaze the same as the binder. 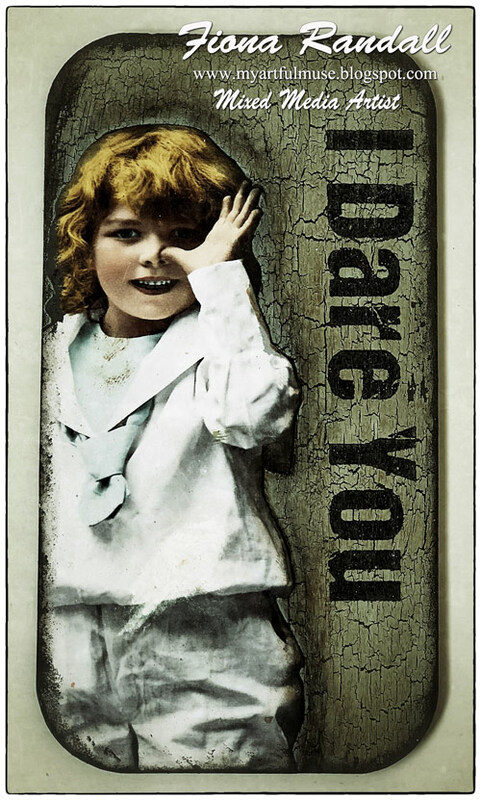 I also antiqued this, before attaching to the front of the binder. 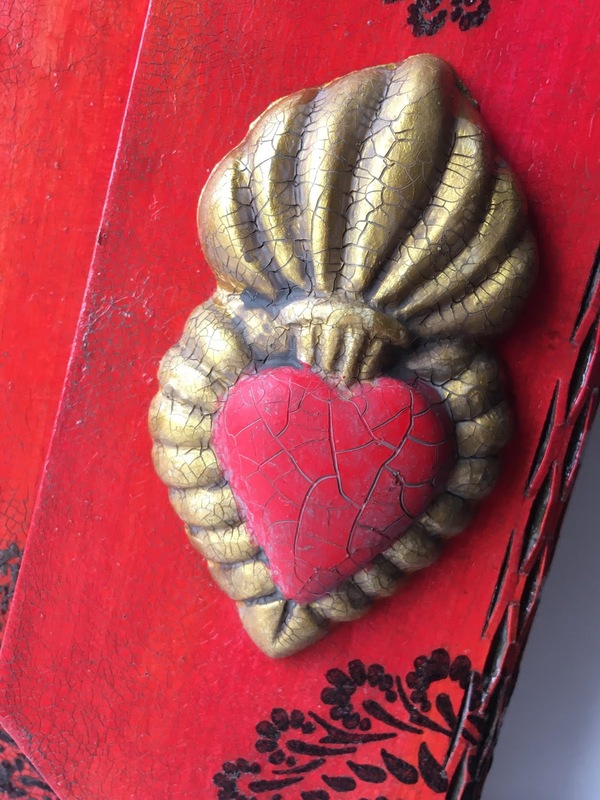 Antiquing Cream is not permanent unless sealed, so I finished off with a couple of coats of Satin Varnish, leaving the heart matte for contrast. 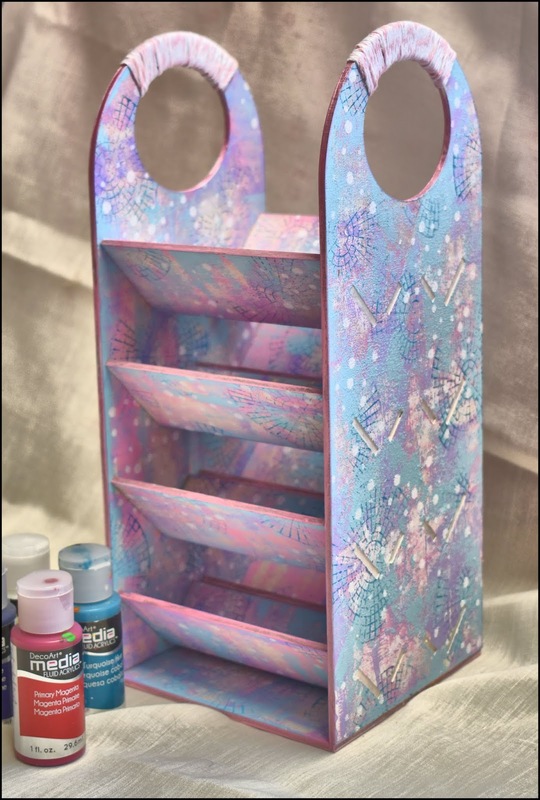 These binders are brilliant for storing your Tando Stencils! Hope you can join the rest of the team this week for their Crackle pieces. DecoArt Media Line Pyrrole Red, Primary Magenta, Pyrrole Orange. Metallic Gold. Raw Umber Antiquing Cream, Crackle Glaze. Satin Varnish. 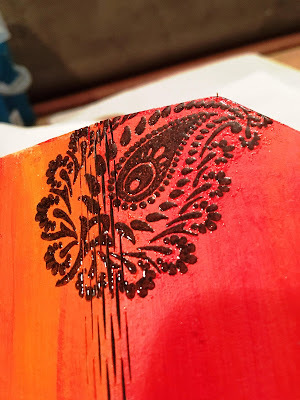 Chocolate Baroque Indian Elephant Stamps. 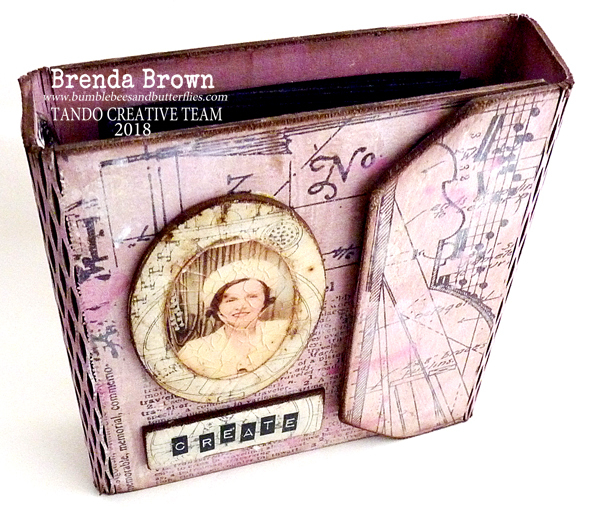 Di has a fabulous selection of Ring Binders in stock of different sizes and I'm sharing the shabby vintage pink one you can see in the photo below. 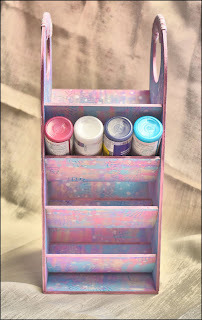 Paint the binder in a vintage mix of pink both inside and out using the DecoArt Premium Acrylics. 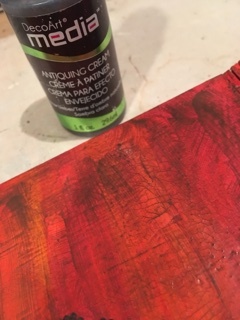 Glue some tissue wrap on the front and back panels and when dry dip them in watery titanium white, titan buff and primary magenta several times drying between each dip. Mix a dirty glaze using premium matte medium, burnt umber and dark grey together with some water and paint it all over. Make the oval vintage lady embellishment by applying some titan buff acrylic paint to a craft mat and squidge the oval and rectangle chipboard shapes to get a bit of texture to it. 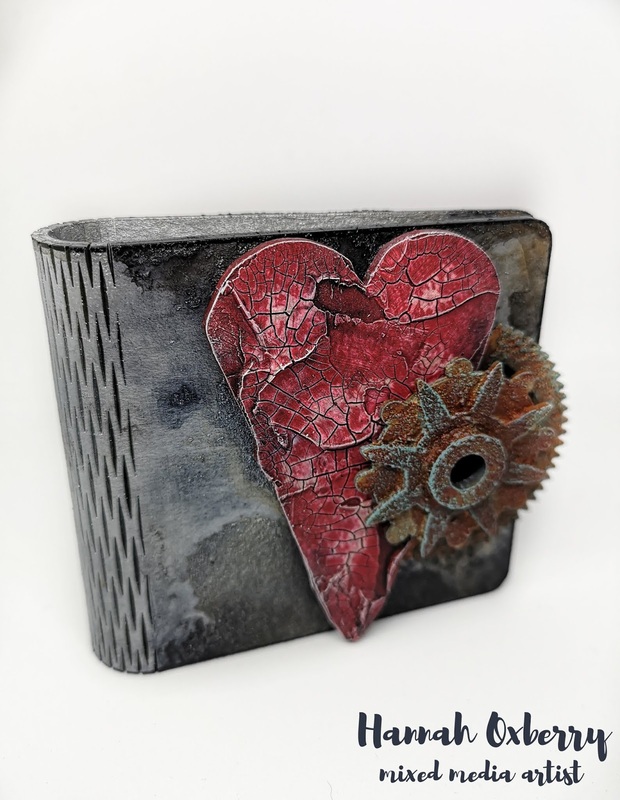 Stamp them with one of Andy's IA Tech Trauma texture stamps. 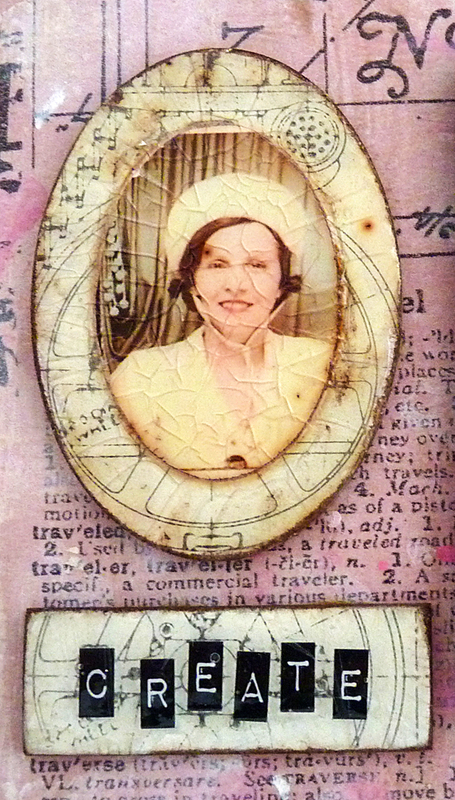 Ink the edges of the photograph with brown distress ink, adhere it to the oval and then add a layer of clear crackle glaze. When dry I rubbed in some white and brown antiquing cream. 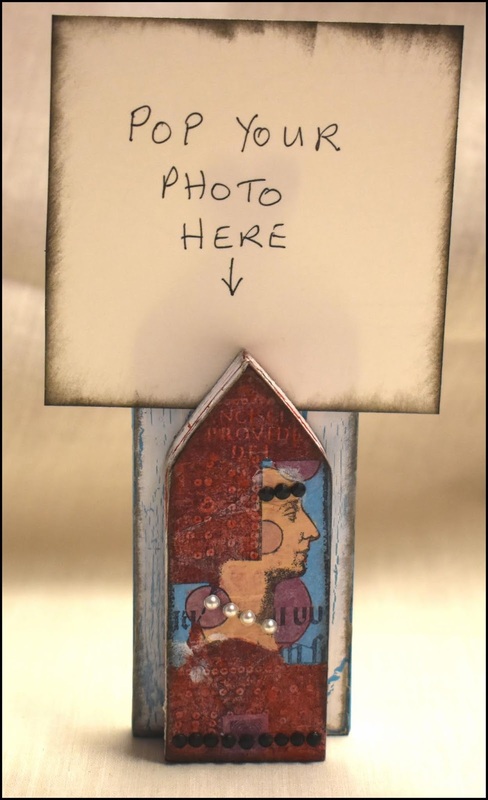 Repeat with the label and use Tim Holtz label letters to make your word. Add a magnet beneath the flap to keep the binder closed when not in use. Now it is ready to be filled with journal pages, stencils, envelopes for collecting things together or whatever takes your fancy. 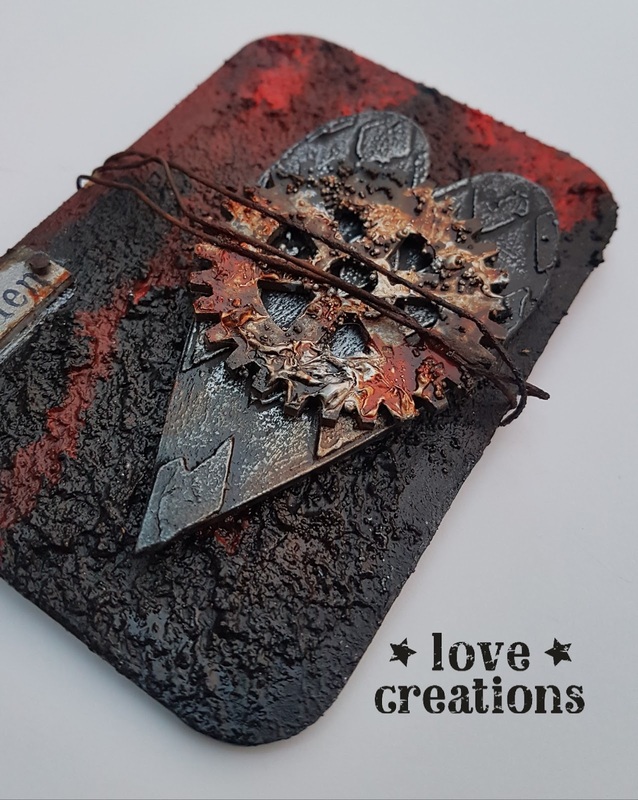 This is another of Di's creations that would make a fabulous gift for someone. It's "everything goes week" and I wanted to share my project with you. These techniques can be used with different substrates or colours. 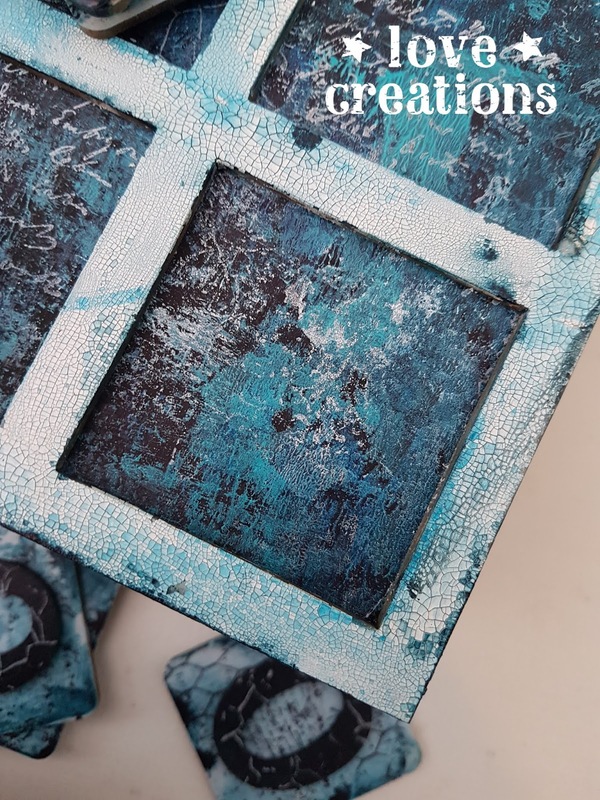 To start with I have primed my mdf media board with gesso, then applied generous amount of texture sand paste randomly and left it overnight to dry. 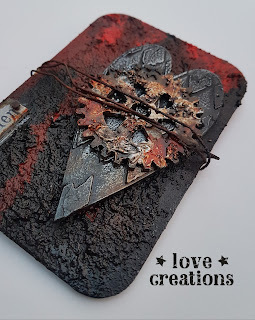 I did the same with heart shape, but used stencil and modeling paste instead. Next, I have painted both with Decoart black acrylic paint. 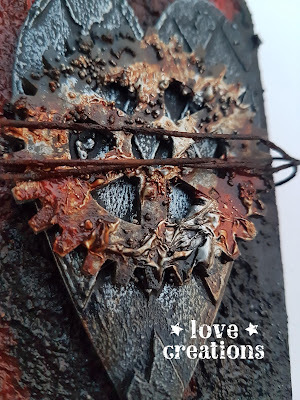 I've highlighted textures on the heart with metallic lustre wax in silver. 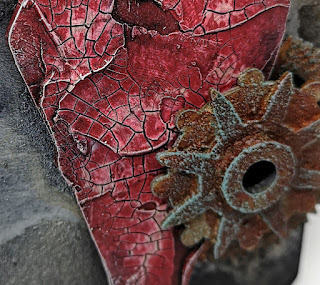 Cog was painted with metallic silver paint and black paint mixed with a little bit of send paste for added texture. On the main board I've added media fluid arcrylic paints in Quinacridone Gold and Pyrole Red from the top of the board, added a little bit of water and let it run down. Little word piece was painted with silver metallic paint and stamped with black archival ink. Once all of my elements were dry I've attached them to the base using heavy gel medium and secured with some rusty wire and added washes of Quinacridone Gold around the rust and word plate. I hope you've enjoyed my post. 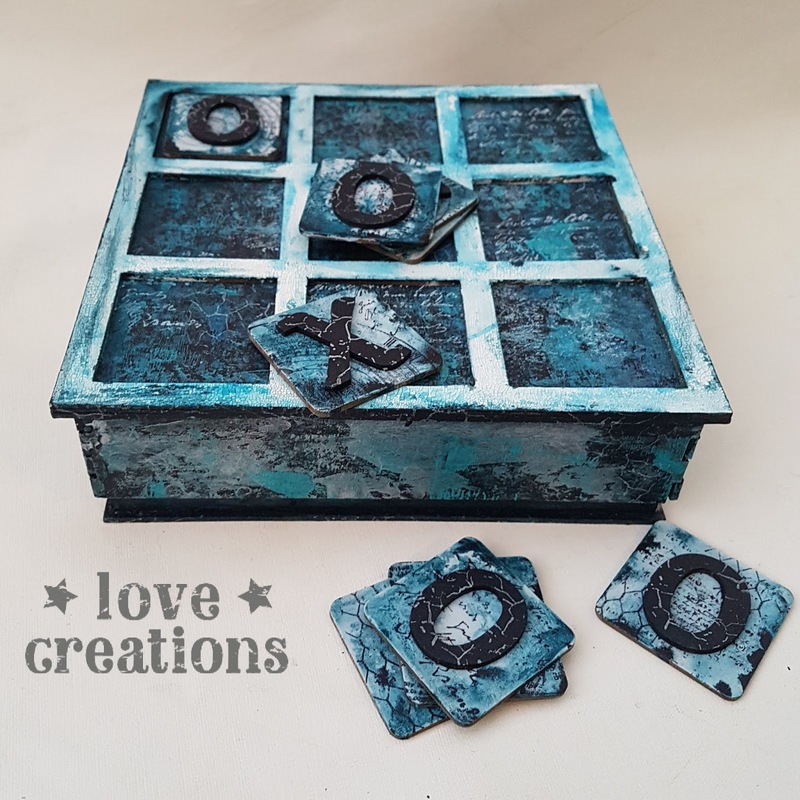 Morning all Fiona here today to share with you a Mixed Media Board with some cut and paste collage added using DecoArt Chalky Finish Paints and Crackle Medium. I started by applying a base layer of Carbon Black Chalk Paint to the media board and dried with a heat tool. 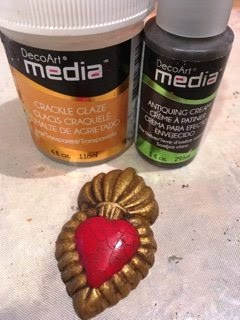 Next step was to apply DecoArt Crackle medium for Chalk paint ( you can gently dry this with a heat tool) Once dry I applied Chalky finish in Vintage in a quick even layer not overworking it and the crackle happens instantly. Once dry I gave the media board a wash of Burnt Umber Media Fluid Acrylic to give it a grungy feel then set it aside to dry. I then sized and printed out my collage Image to fit the media board from Tumblefish Studios ( now retired) and fussy cut and applied to the now dry media board base with matte medium. Black watercolour pencil was applied around the collaged image and smudged to define the edges. 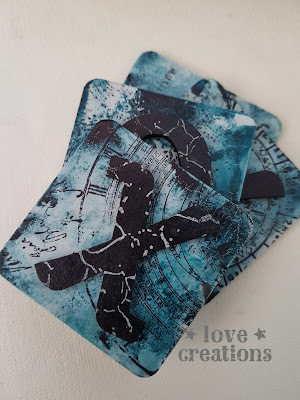 Stamping using Black Archival Ink was then added using Andy Skinner's Unexplained Rubber Stamp Set and the edges stamped with Andy Skinner's Industrial Rubber Stamp Set. 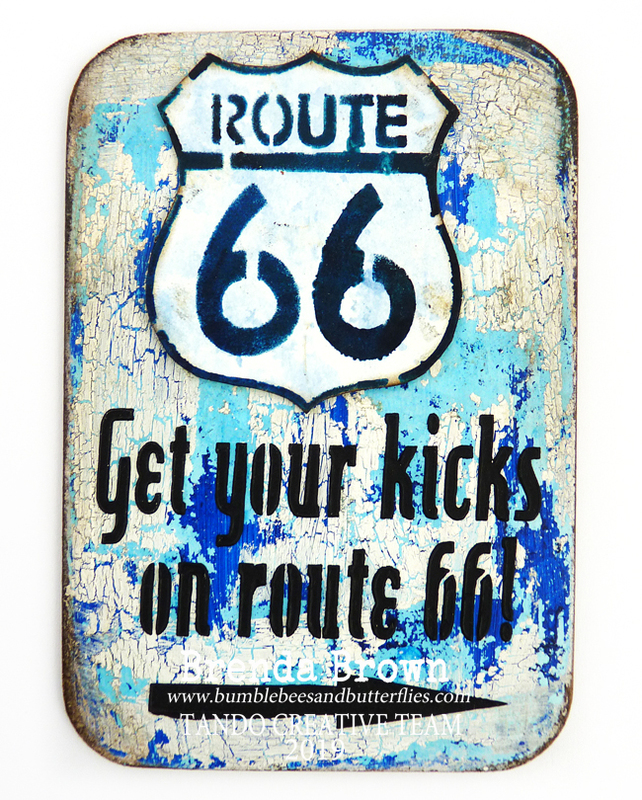 The whole media board was then given a coat of DecoArt Ultra Matte Varnish to seal and finish. Andy Skinner - Unexplained Rubber Stamp Set. Andy Skinner- Industrial Rubber Stamp Set. Chalky Finish- Carbon Black; Vintage. Crackle Medium- For Chalk Paints. Media Fluid Acrylics- Burnt Umber. 😊😊Hello lovely crafters! 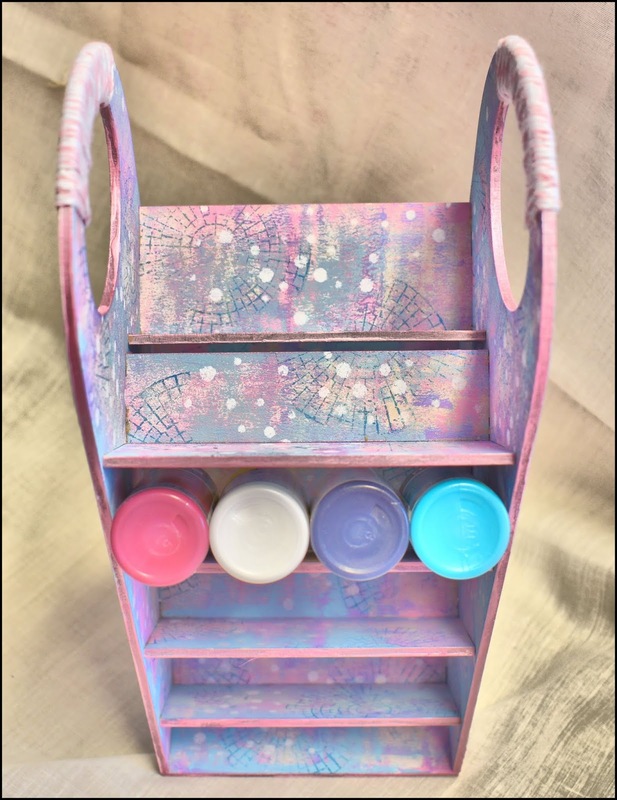 As my paint stash grows more and more I am finding space to be an issue in my craft room. Ever late to the party as I think most of the DT already have one, I have decorated a *PAINT SAINT*. 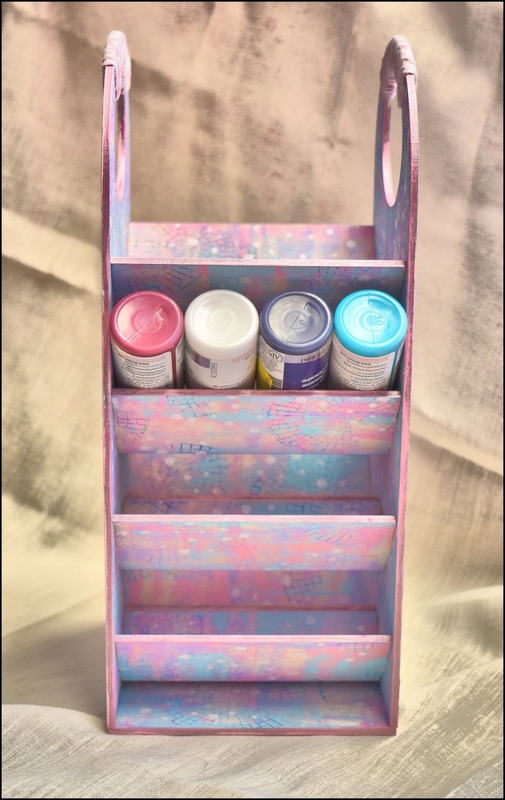 If you haven't seen one of these you will be amazed that storage with a 5inch square base can hold 32 1oz pots of paint!!!!!!!! It will also hold the next size up but not so many. 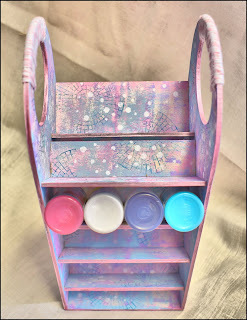 This comes with instructions and is very easy to put together and easy to decorate if you use a brayer, which I did :-D I softened down the *media paints* (Primary Magenta, Cobalt Teal Hue & Dioxazine Purple) with *tinting base* to make pastel shades before randomly brayering them on all the surfaces before putting them together. Then I added some white spots and some stamping. You can see that they form two trenches (for want of a better word haha) onto which you lay the pots. To finish my Paint Saint off I wrapped some *Bakers Twine* around the handles.